Hen noticed the other day that we were fast approaching our 200th blog milestone, so thought we’d better mark the occasion! We started blogging in April 2015 – we’d taken part in a Digital Marketing course for local businesses and one of the pieces of advice is that doing a regular blog can help build a connection with people who are interested in what you do. 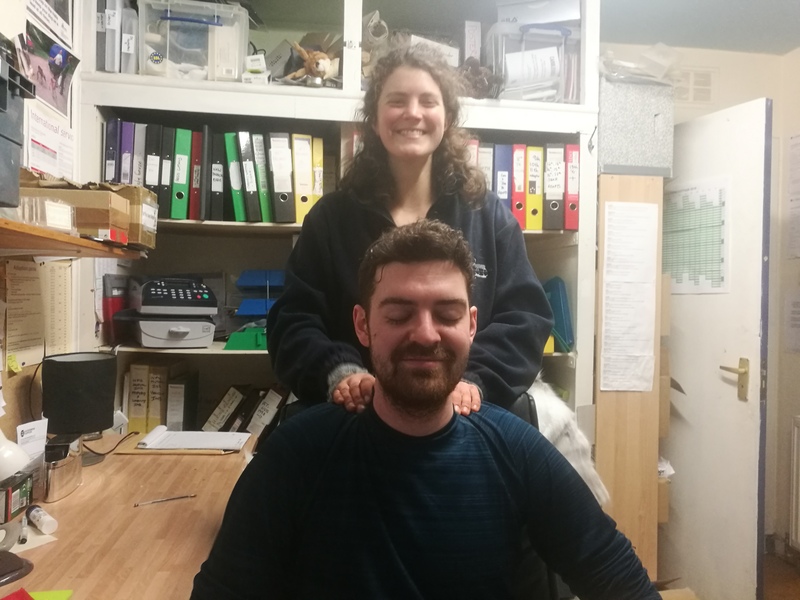 We thought we’d better give it a go, and somehow (sometimes by the skin of our teeth) we have managed to post a blog every Friday without fail since – the “schedule” function means that we’ve even covered Christmas Day and New Year’s day. 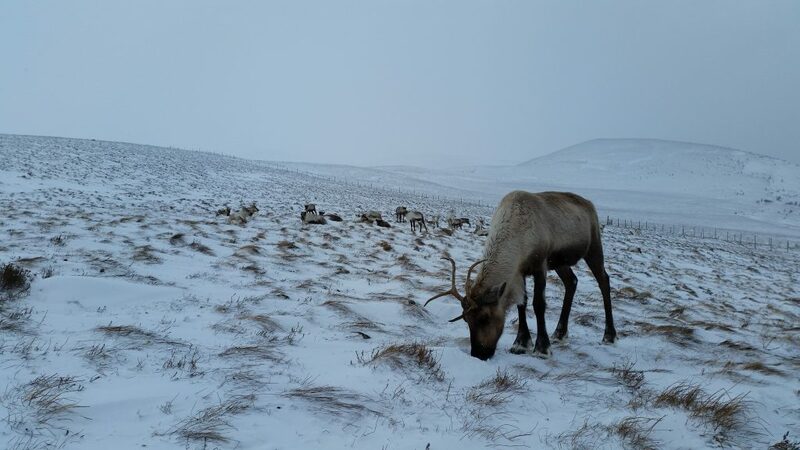 We try to cover lots of aspects of reindeer, seasonal life here with the herd, funny stories, and general nice photos that give you a taste of what’s going on. 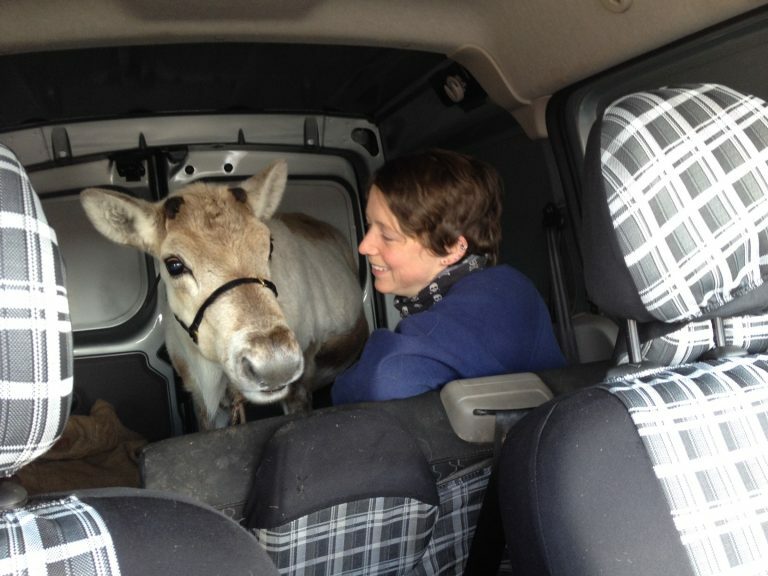 Our first blog featured Esme’s impromptu journey in the back of the van, later that year we looked at the traumatic calving bet, and volunteer Emm wrote about her experiences with the herd and how they’ve helped her. 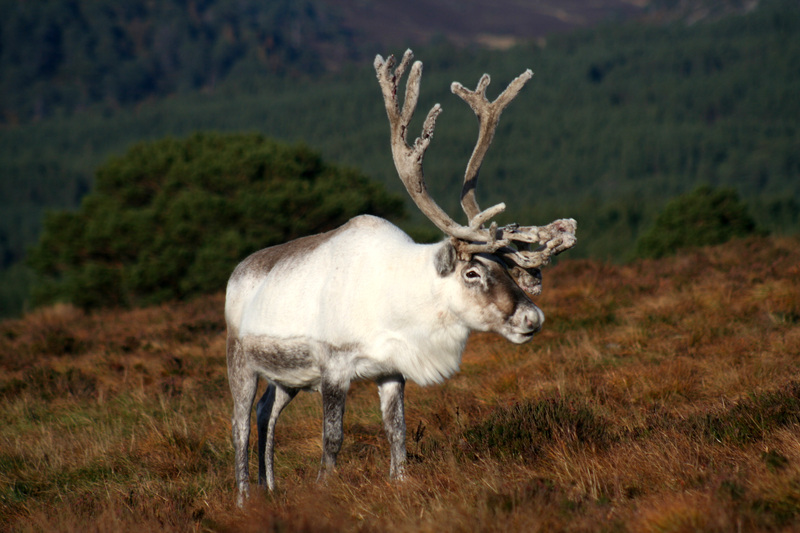 We’ve covered some educational topics, looking at how reindeer change in appearance throughout the year, reindeer of the Southern Hemisphere, and antler stripping (steady!). 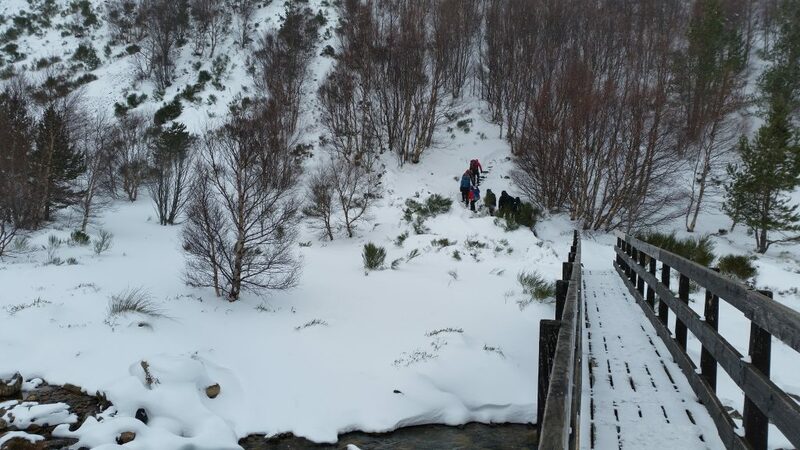 We’ve focused on the local wildlife, our dogs, and the geology of the Cairngorms. 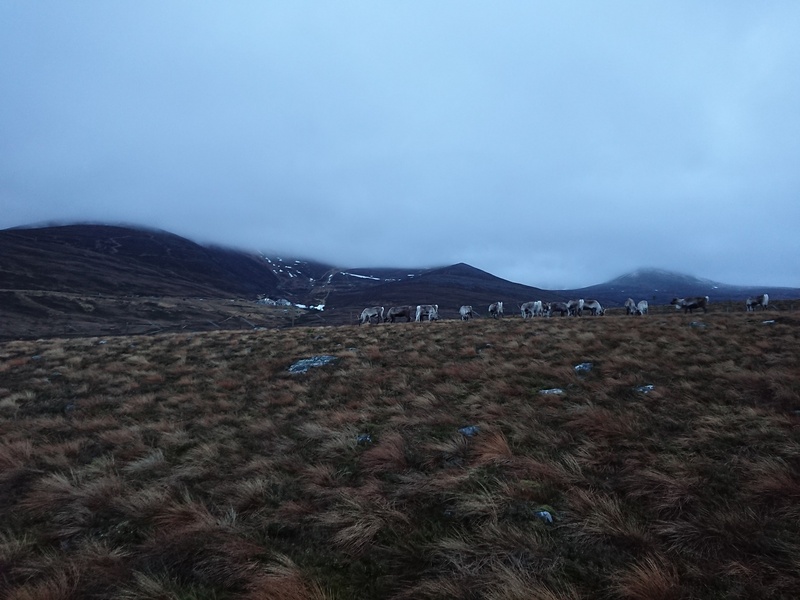 We admit that sometimes when we run out of time, we plump for photo blogs: in the wild winter, free-ranging or the new calves. 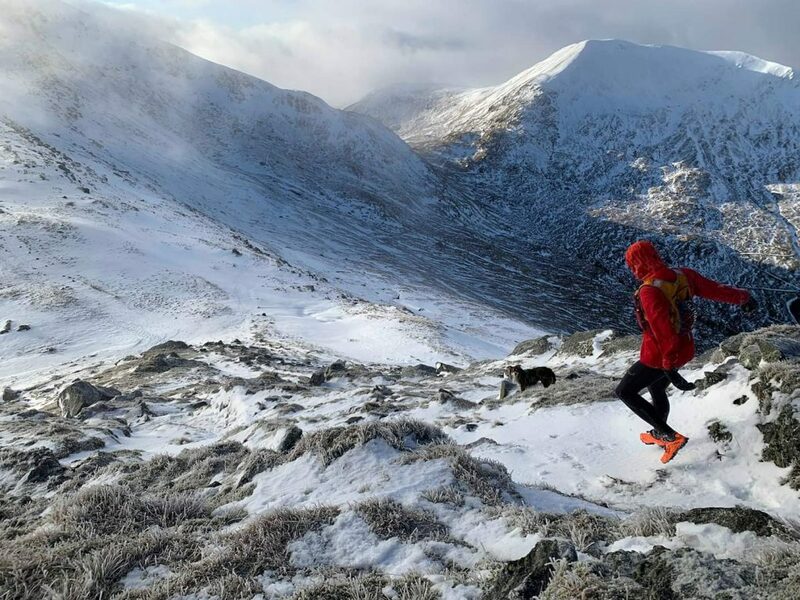 It may not come as a huge surprise to readers that many of our herders are hill runners. 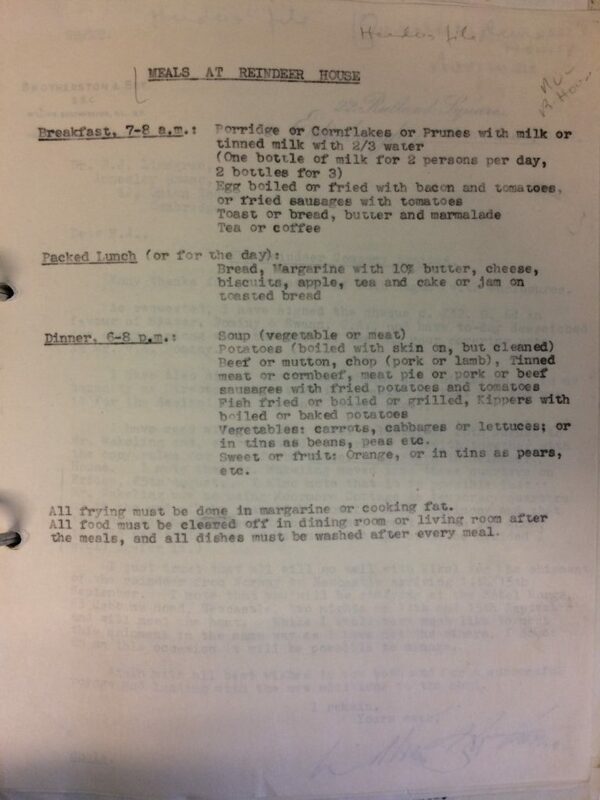 In fact, I think almost any herder could be described as one depending on how you define runner. 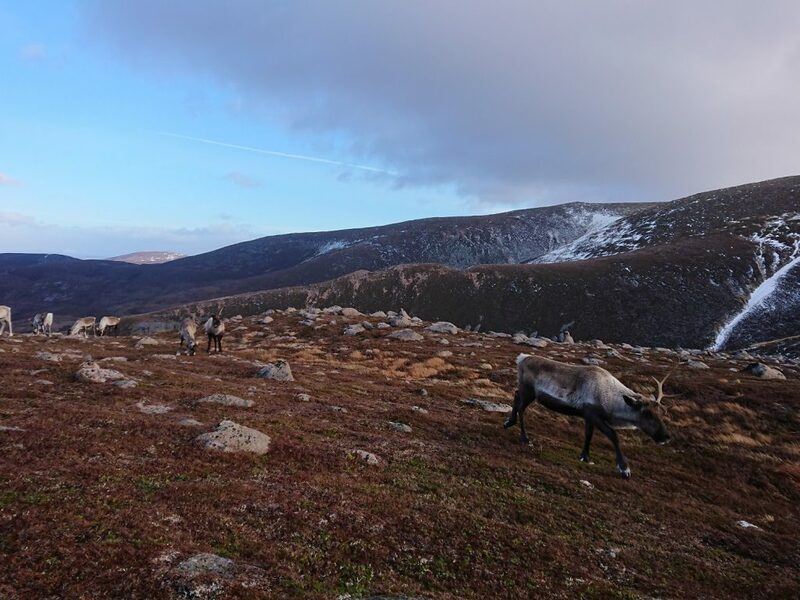 A run in the area where we and the reindeer live is almost automatically a hill run and sometimes herding reindeer includes running or fast walking in the hills. On that note, much to my surprise, I found a Dutch book lying around in the office a couple of weeks ago. Being the only speaker of Dutch at the centre (apart from some inappropriate use of Dutch words by Chris which I have absolutely nothing to do with, I swear), I decided to have a wee look through it. It was an incredibly interesting book about humans and long distance running, written by legendary long distance runner Jan Knippenberg. 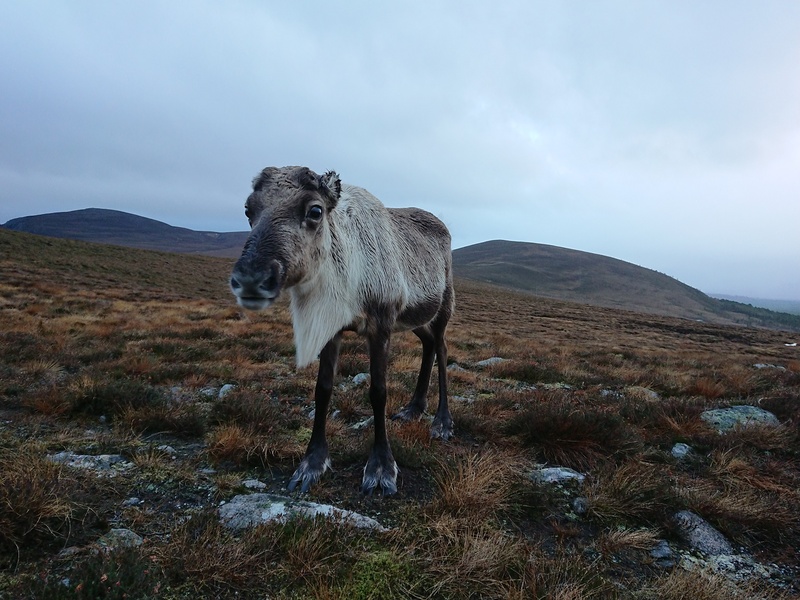 Later on I found out that Tilly (the owner of the herd) had been given the book, as some chapters involved the reindeer herd and Mikel Utsi, the founder of the herd. 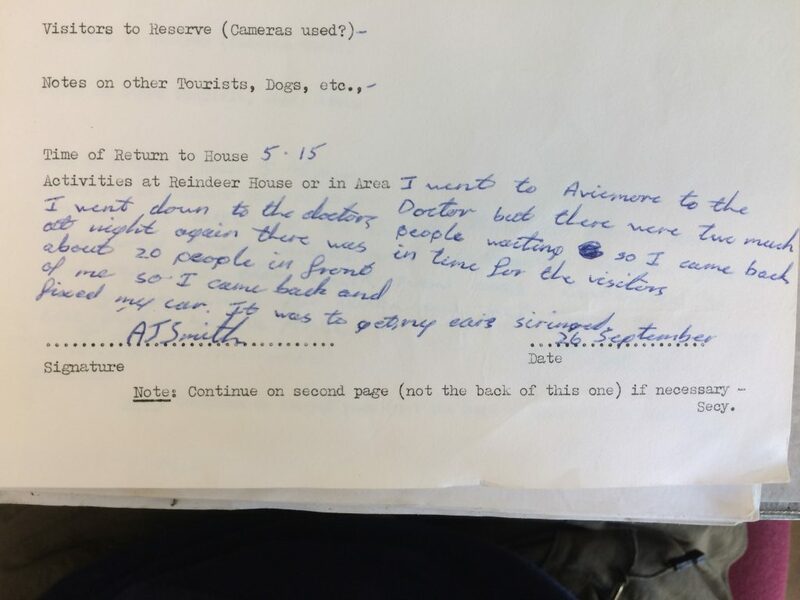 Apparantly, Knippenberg is even the one who initially got Alan into hill running, a form of pastime he is known to be very fond of these days. Tilly asked if I wanted to read bits of the book and write a blog about it, so here goes. 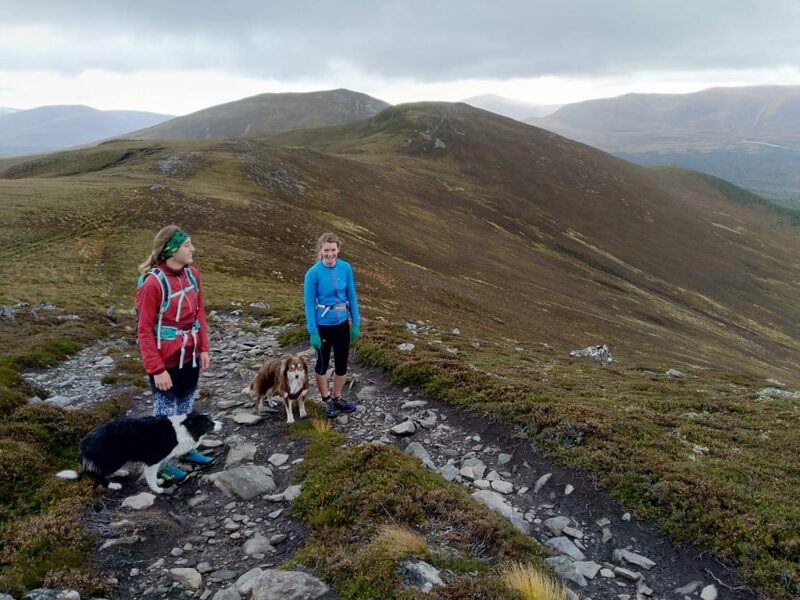 Manouk, Kay, Sookie and Tiree with Mealle a Bhuachaille in the background. In the book, Knippenberg explains that, in the history of the human being, it’s relatively very recent that we changed our active lifestyle of walking or running around for spending most of our days sitting or standing still. 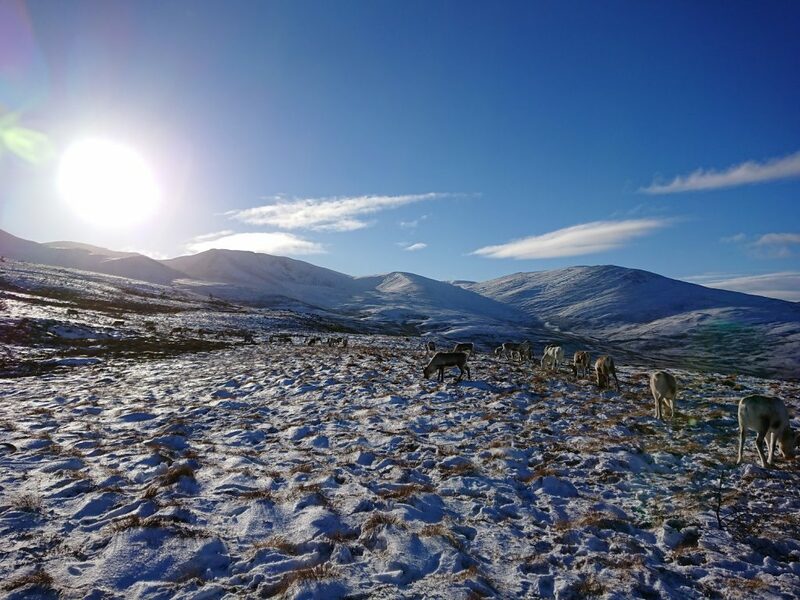 As examples of how we used to live he mentions the hunter-gatherer lifestyle, the lifestyle of shepherds or herders of animals, and the Scottish gillies (helpers of lairds) who walked long distances to convey messages. Eventually he makes the point that the “running hype” is not, like we tell ourselves, a way to battle the new inactive way of life most people live, but rather a creation of society brought forth by the hype of commercial marketing and a desire to be “fit”. This “being fit”, according to him, is something completely different than the state we once had to be in, in order to survive. Knippenberg argues that the marketing and popularising of “jogging” makes it a commercial thing, alienating it from what we used to do as children, simply because we felt like it. Running around on the beach, chasing each other around in a field, competing against our playmates to see who is the fastest, these are all examples of unlimited running that are closer to our native human nature instinct. 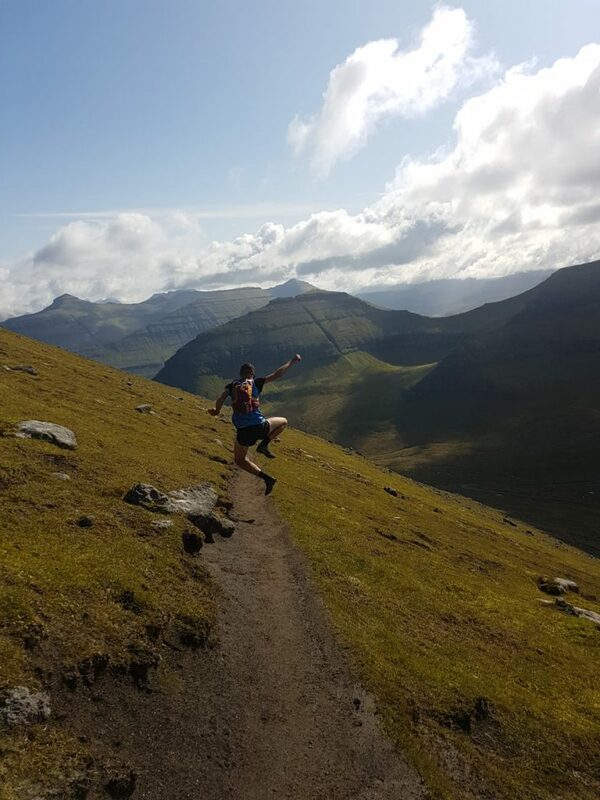 Running for the pure joy of it or because our lifestyle demands it, without the faff of getting involved in fashion and hype, or keeping track of time per kilometre, heartbeat, acceleration etc. 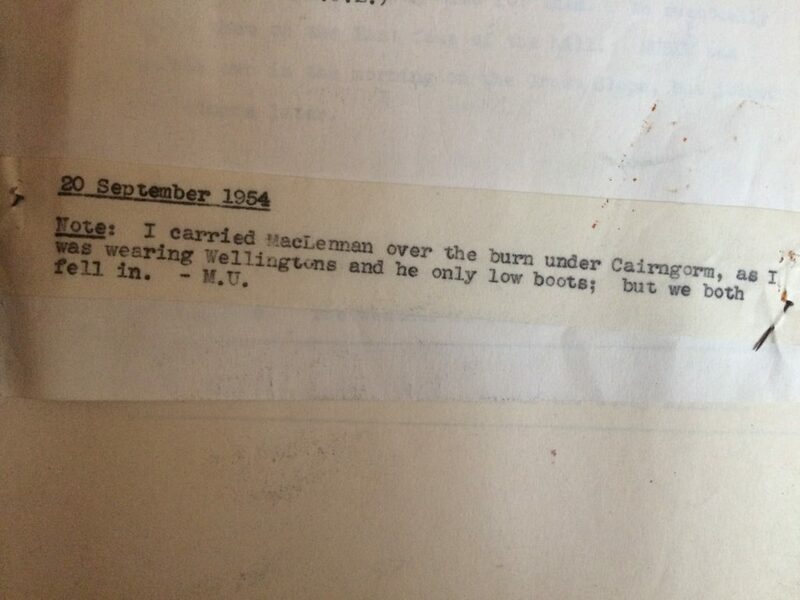 seems to be closer to the old type of lifestyle than what is currently in fashion. 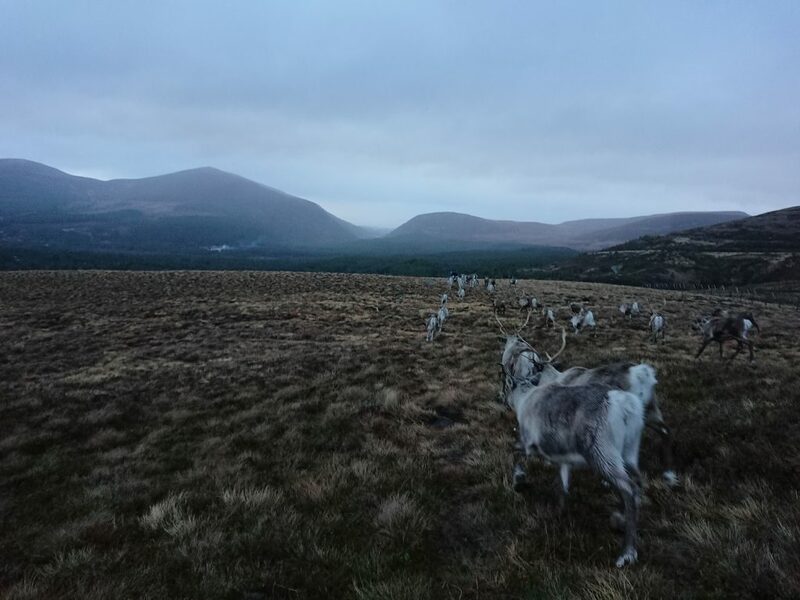 Right, back to hill running and reindeer herding. As a new herder in summer, I built up my stamina quite quickly. 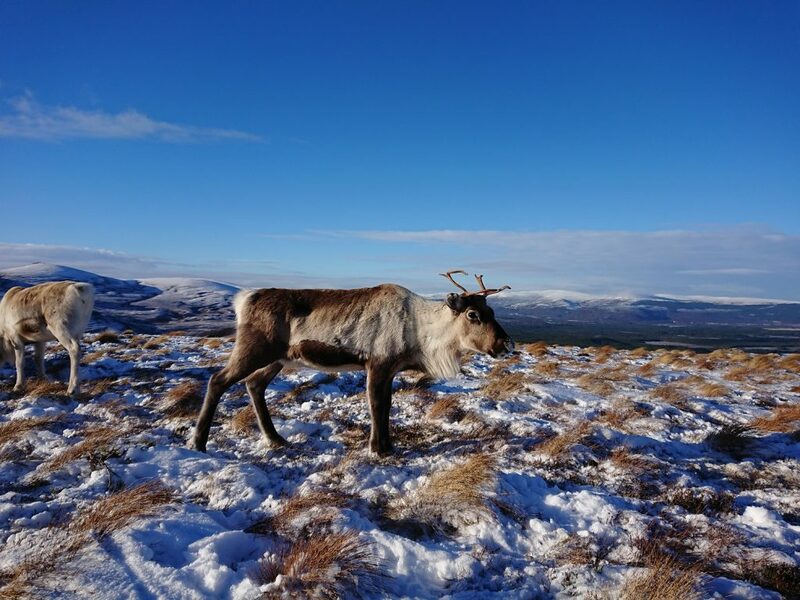 This happens automatically, especially in the summer months, when we sometimes chase free ranging reindeer to where they are supposed to be, go up the hill a couple of times a day, and spend a lot of our days off walking or running around in the mountains. 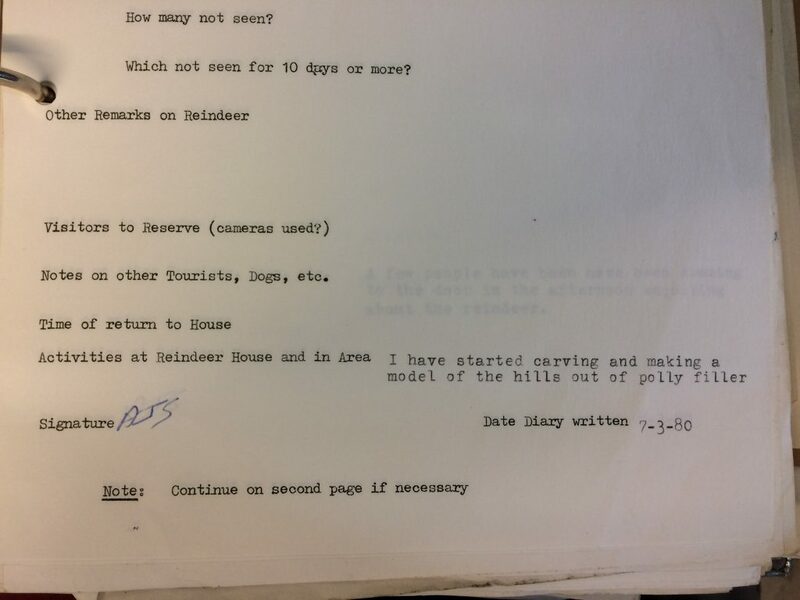 Because we have a purpose none other than doing something with reindeer or enjoying nature, I think this comes quite close to what Knippenberg describes. I think most of us herders enjoy being in the mountains, a bit like a child enjoys running around on the beach. I don’t know if the job attracts the type of person that is likely to enjoy hill running, or that the job changes herders into hill runners. 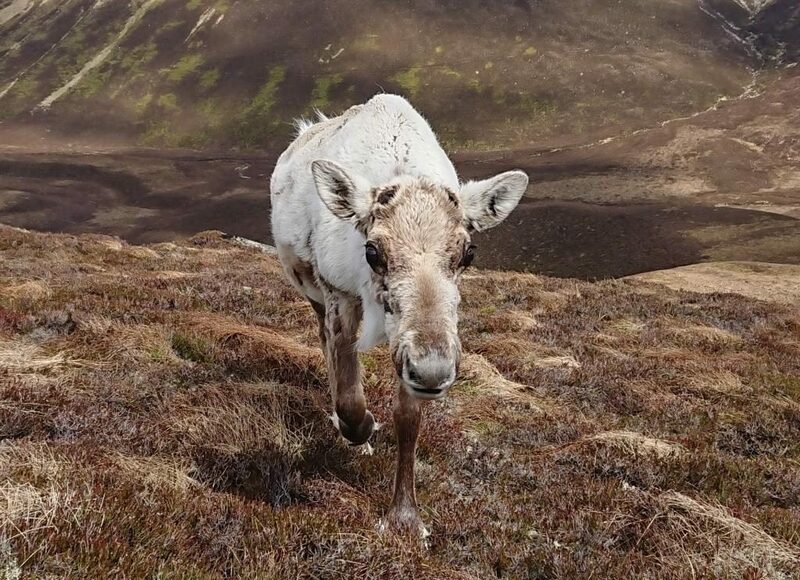 All I know is that there are a lot of people that take up hill running while working at the reindeer centre. It’s also striking that nonetheless, most of us don’t necessarily describe ourselves as runners. 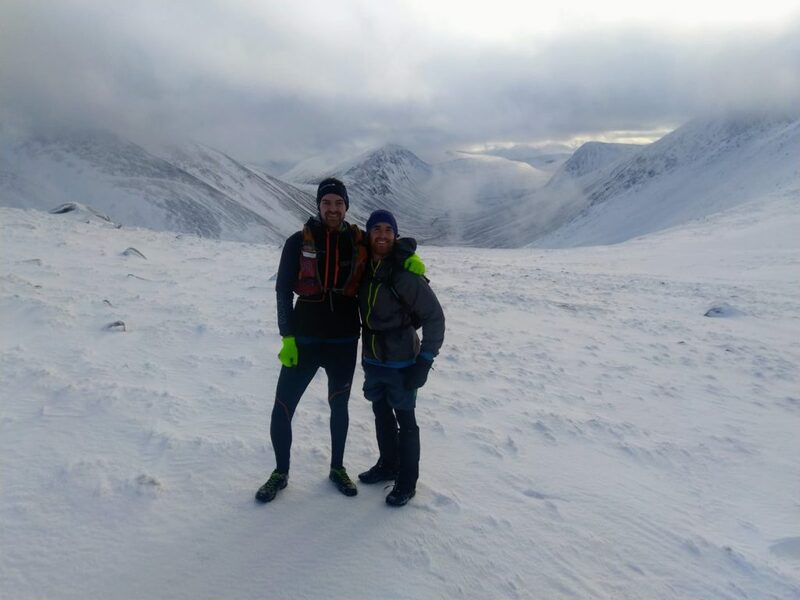 This confirms my theory that the way we “run” is not for running’s sake or for fitness, but for work purposes or for having a good time in the hills. 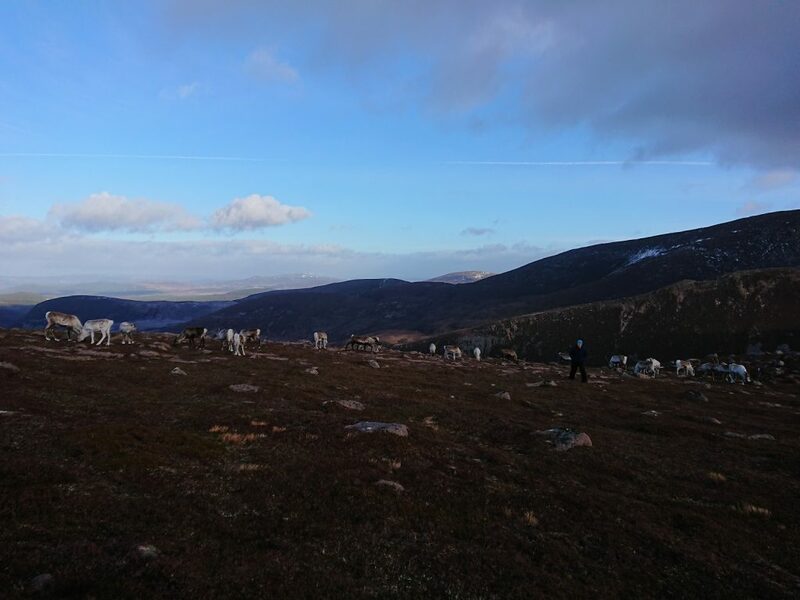 It’s interesting that the lifestyle of a herder is mentioned by Knippenberg as one of the old ways of living prior to our sedentary lifestyle, and that the type of running described by him as long distance running seems very close to how it’s done at the centre, with a childlike joy. 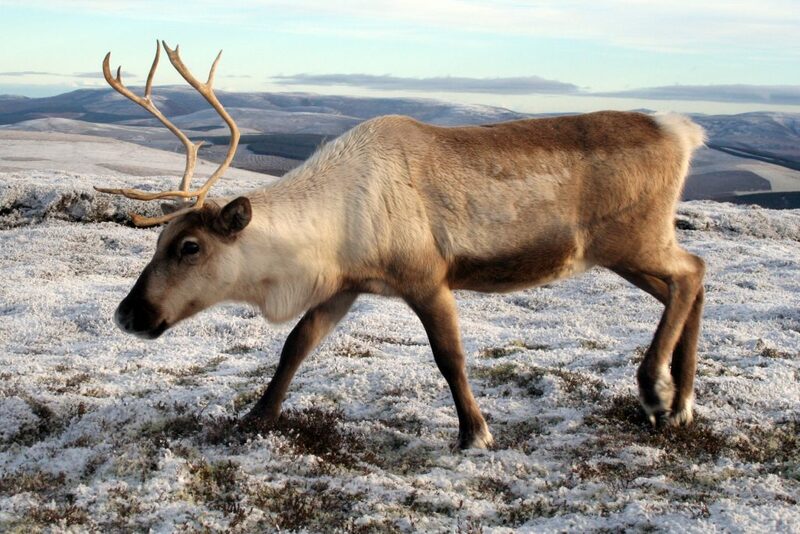 This Christmas the Cairngorm Reindeer Centre has been given a very fancy Christmas present. 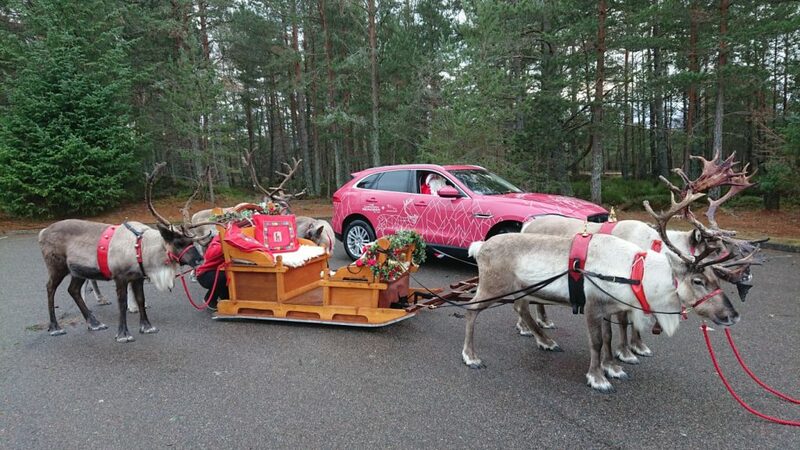 Jaguar cars have given us a 4 x 4 F Pace to drive around free of charge for the next 6 months. 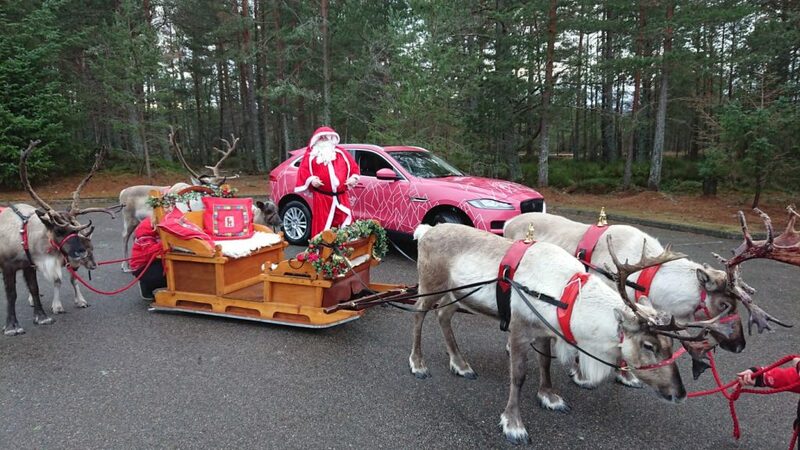 Adorned with Cairngorm Reindeer and Jaguar logos it has certainly turned a few heads! So on Christmas Day when we were just about to do a local reindeer event at the Coylumbridge Hotel, Santa was in a dilemma, there were two modes of transport. 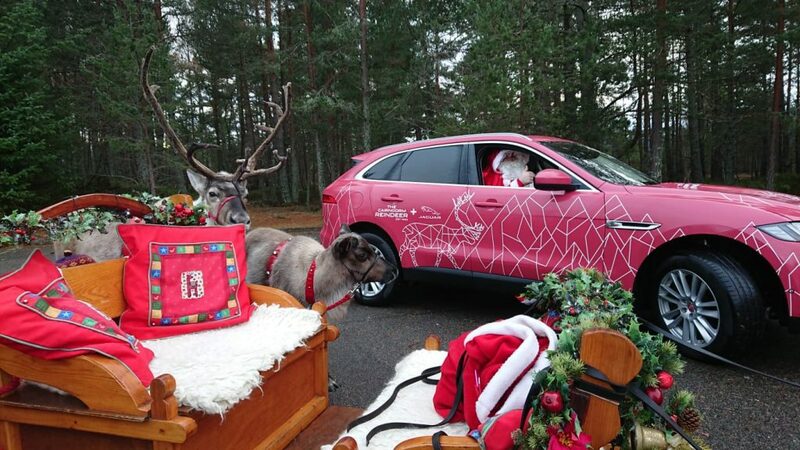 A team of reindeer and sleigh, with a hard wooden seat and a team of exhausted reindeer (who had done too much flying on Christmas Eve) – or an extremely comfortable, fully automatic Jaguar F Pace 4 x 4. 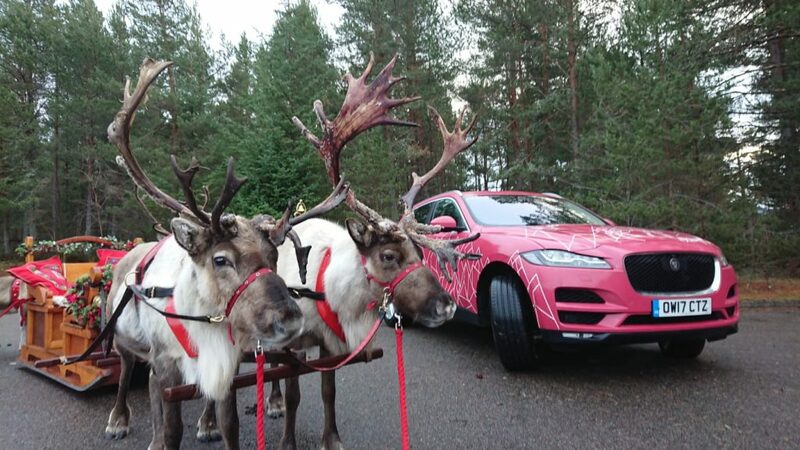 He chose the Jag, but of course the children waiting at the hotel would be very disappointed if Santa rocked up in a car so he was ceremoniously booted out and plonked in the sleigh instead! 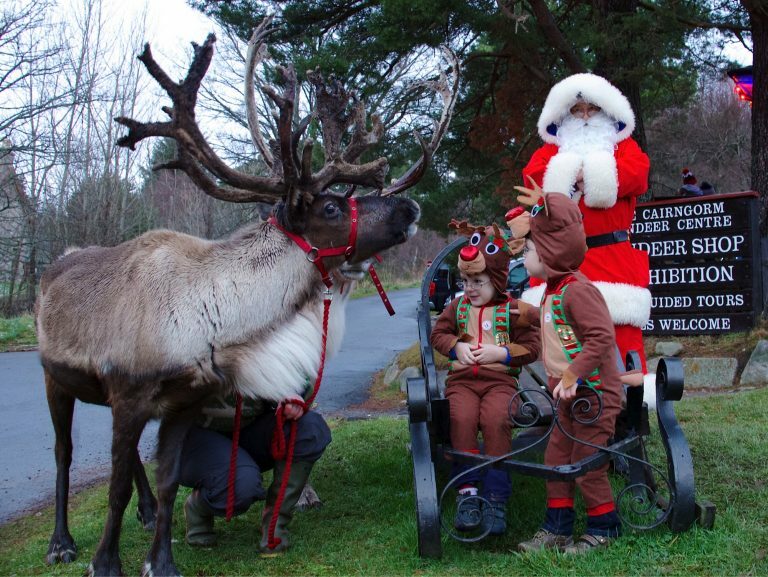 All our reindeer events have gone extremely well this year and everywhere we have gone we have put a smile on people’s faces. 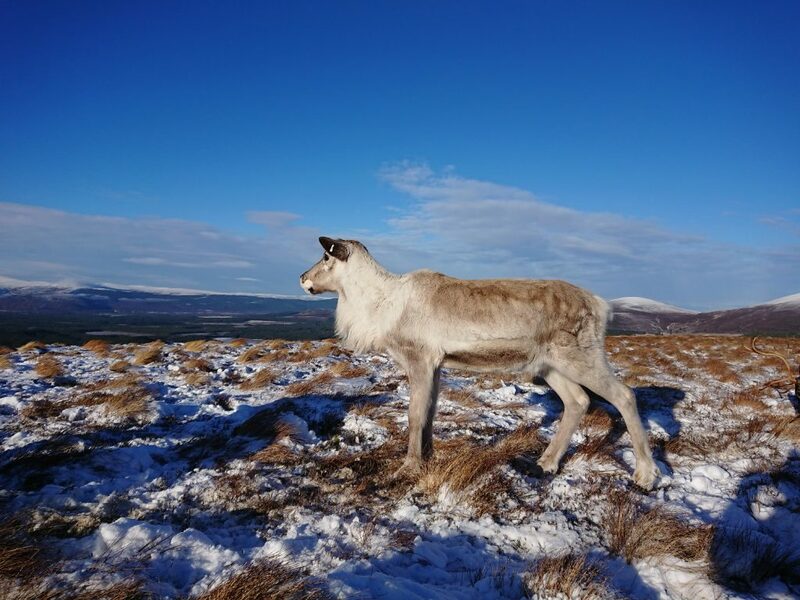 All those reindeer we train to harness are now back on the hills and enjoying a well-deserved rest, and it will not be until next October that we bring out the harness, dig out the sleighs and decorations and prepare for another Christmas season. 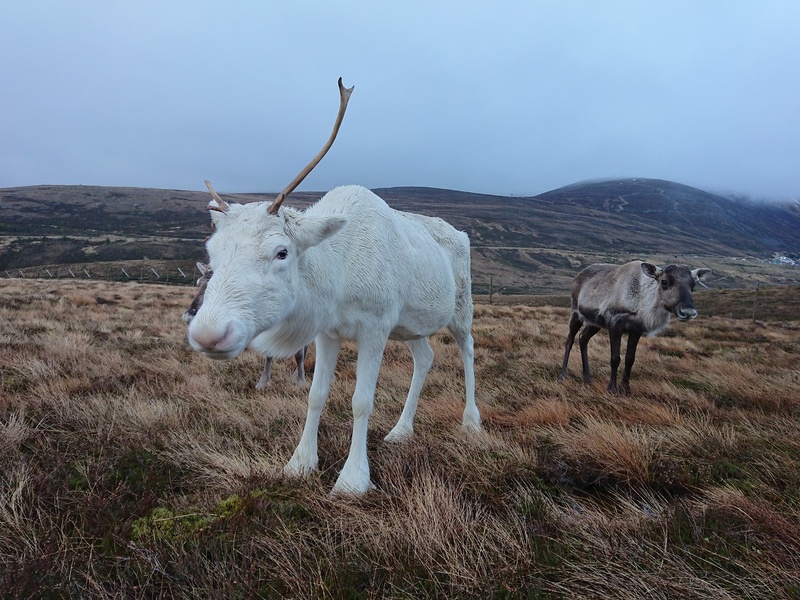 For the Christmas reindeer it’s not a bad life, 10 months off and 2 months doing some work. I can think of worse jobs! 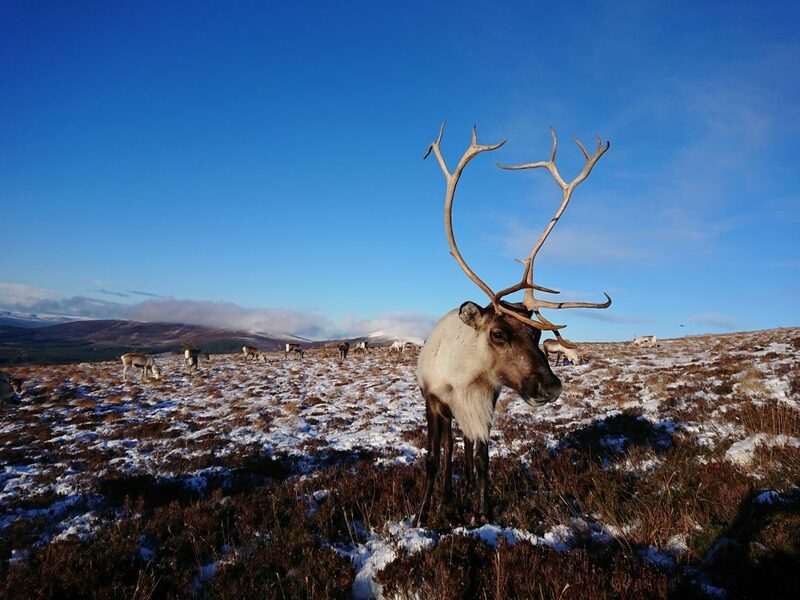 All our reindeer have now grown their lovely thick winter coats and laid down substantial fat layers to survive the winter. But where is that cold snowy weather, indeed this is one of the mildest Christmases I can remember. 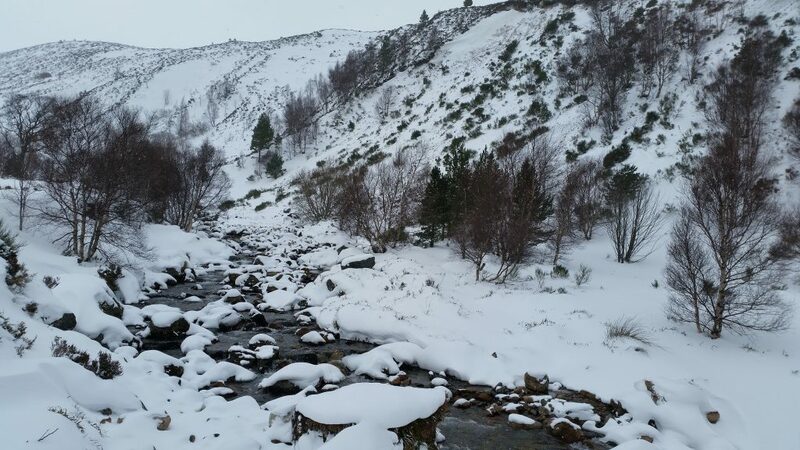 Maybe the New Year will bring the snow, we will just have to wait and see. 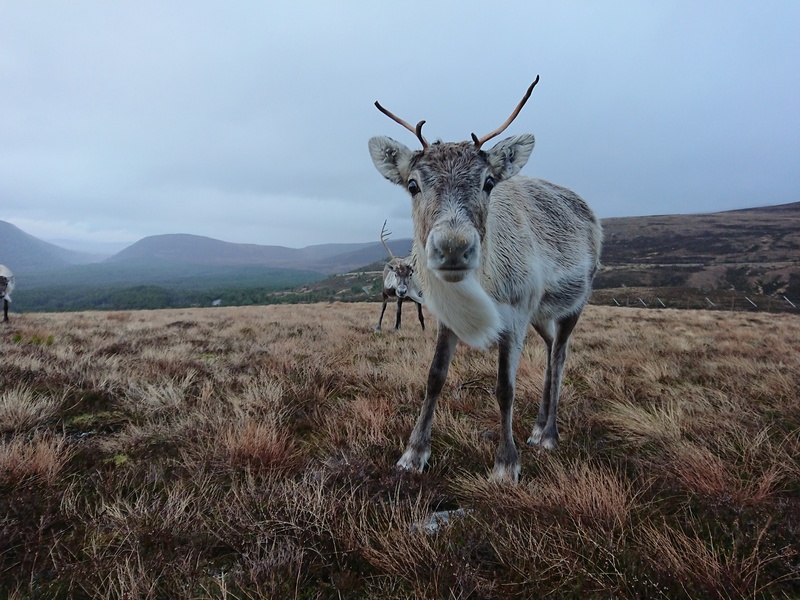 So from all of us here at The Cairngorm Reindeer Centre we hope you had a good one this Hogmanay and best wishes for 2019! 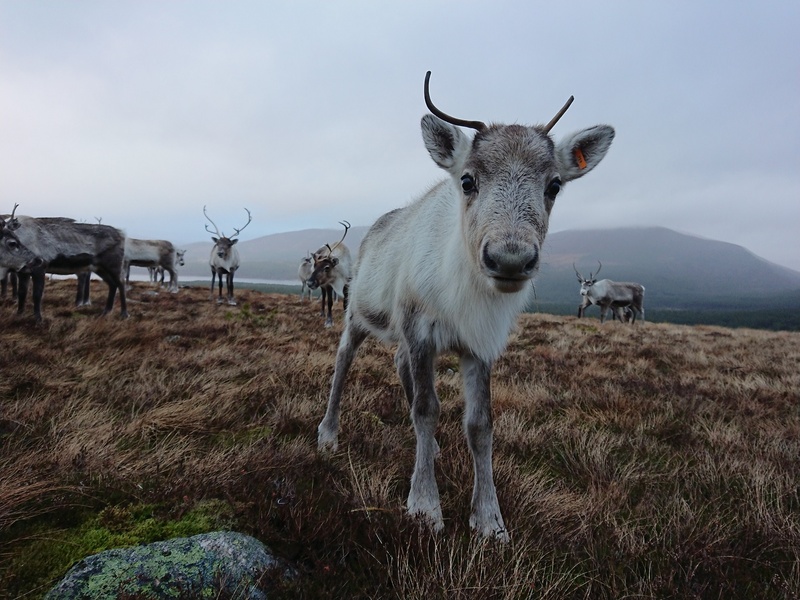 Last winter I had the amazing pleasure of volunteering at the Cairngorm Reindeer Centre for the first time. 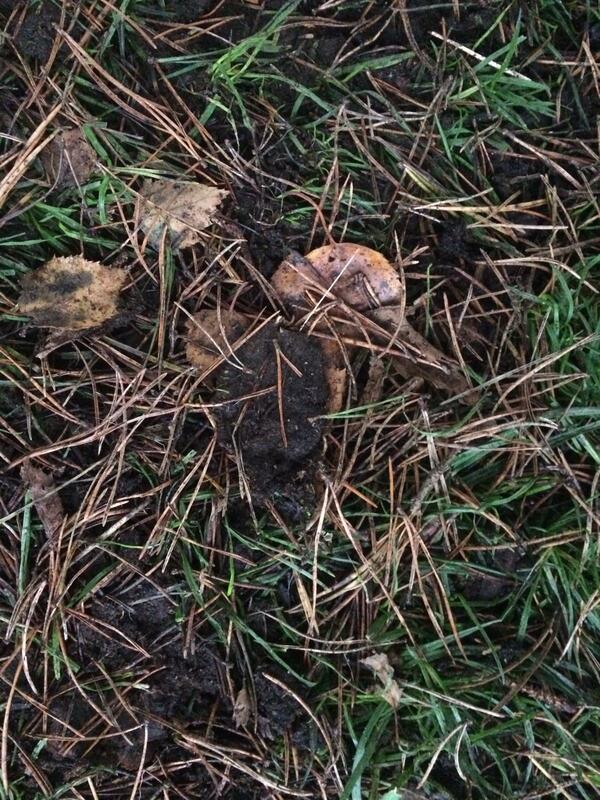 After two poor winters, and by poor winters I mean that we had a lack of snow. 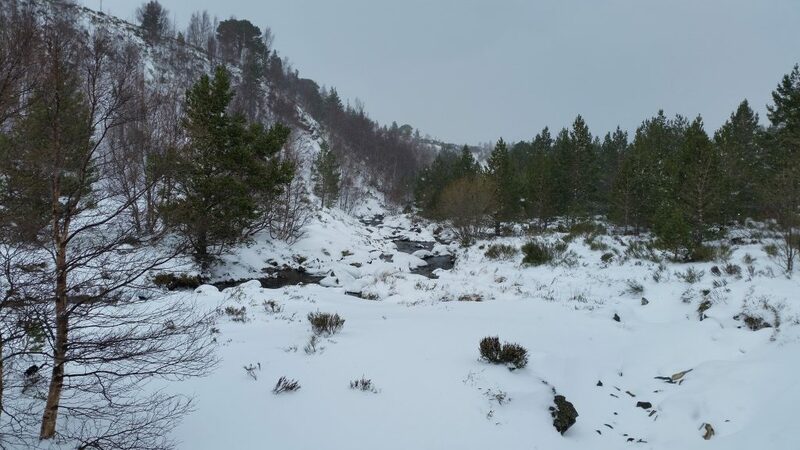 Most people in the UK would probably deem a good winter one with little snow. 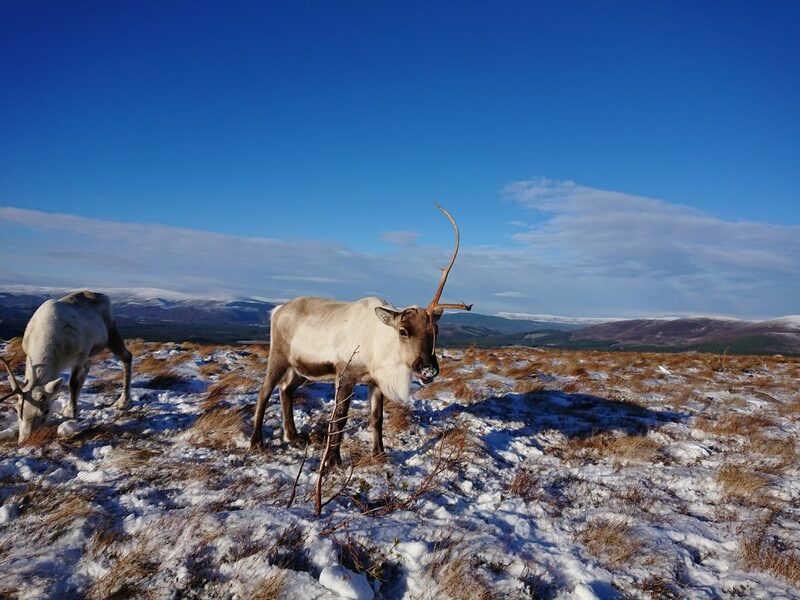 But here in Aviemore and the Cairngorms, both as skiers and Reindeer Herders, a good winter is one with a plentiful supply of snow! 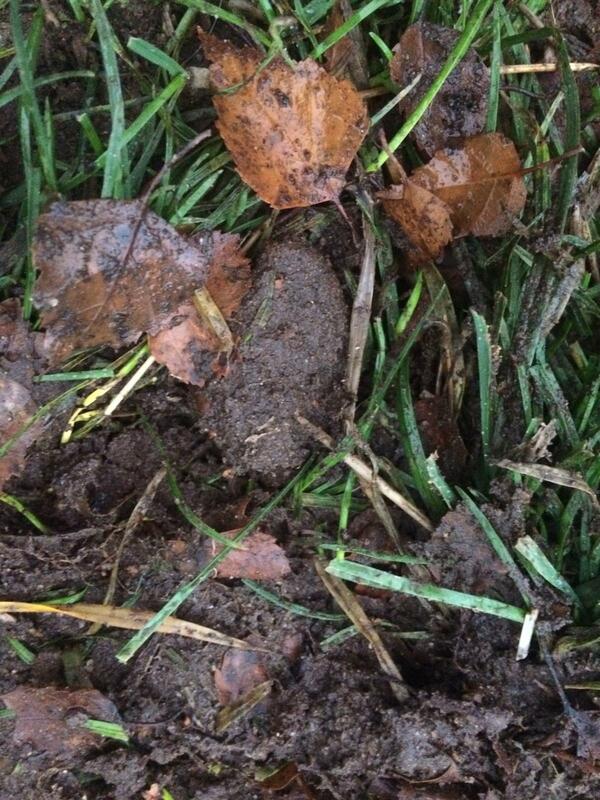 And preferably one with as little of the usual high winds as possible. 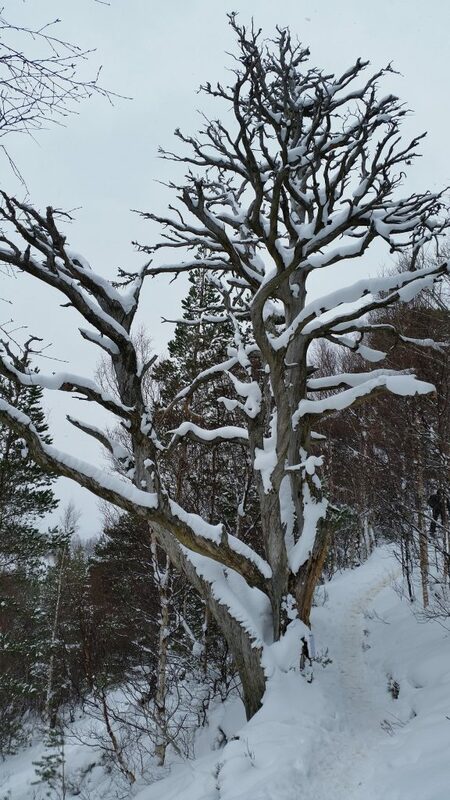 Thankfully, this year, our snow dances were answered with a good supply of snow and a fairly long winter season. 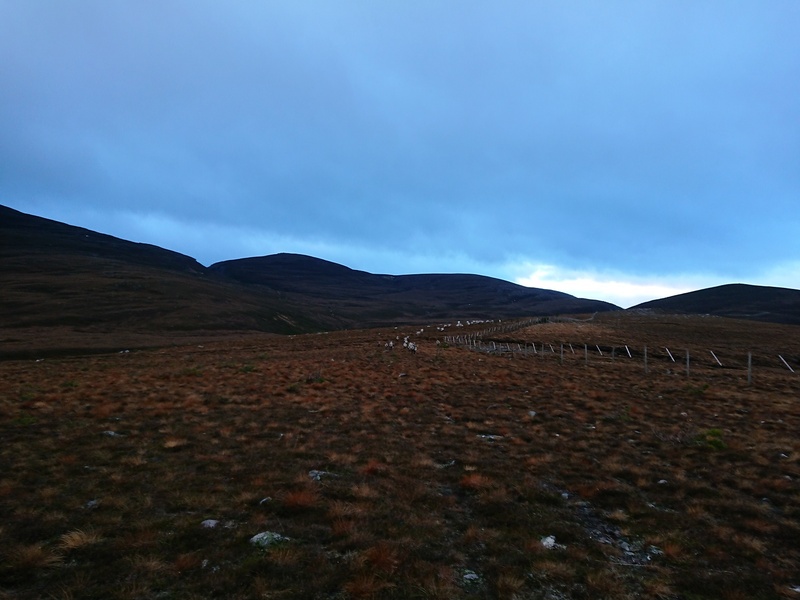 On the days I volunteered we had calf deep snow to trudge through and 60mph cross winds to battle through to find the Reindeer Herd first thing in the morning. 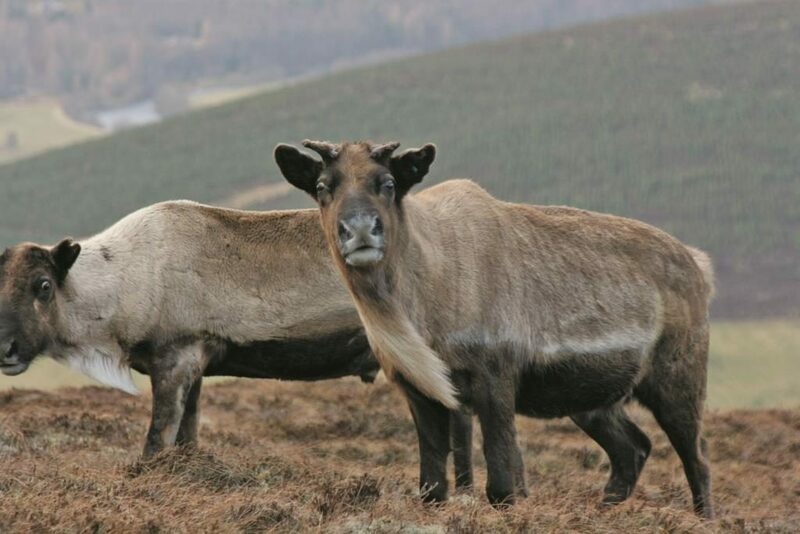 This was my first experience of seeing these magnificent animals in their natural environment out on the Free Range on the mountains. 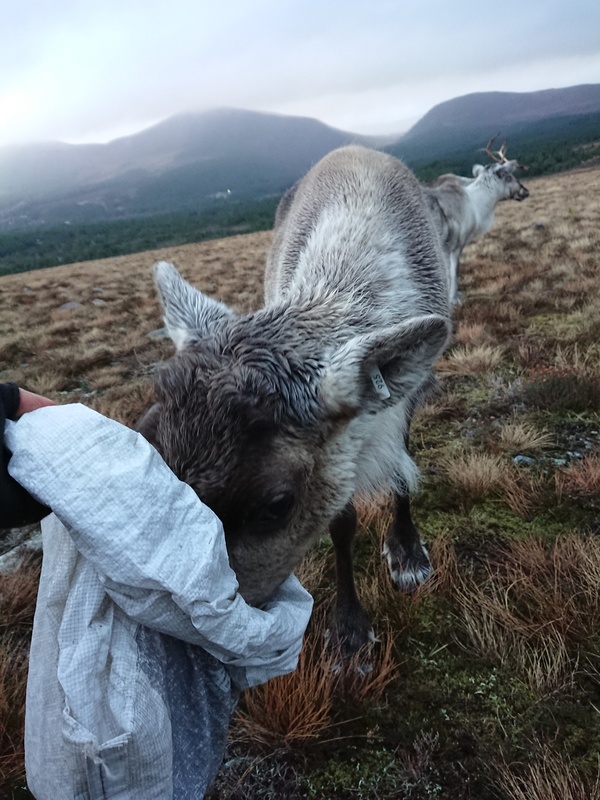 This was also the first time I had the pleasure of hearing the traditional Sami call Reindeer Herders use to summon the Reindeer down from the mountains. 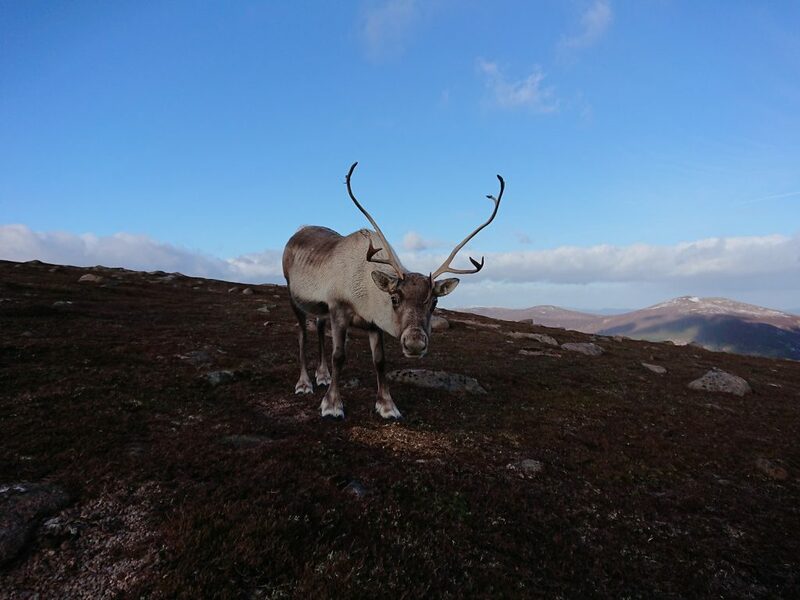 To my surprise the Reindeer weren’t sheltering in any of the Corrie’s out of the wind, but instead were standing on the most exposed ridges bearing the brunt of the strongest gusts of wind. 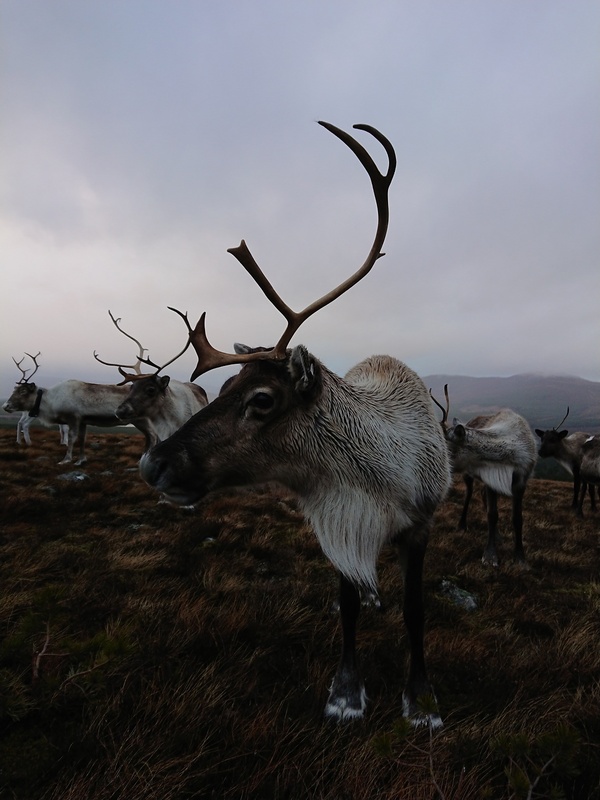 Once one of the Reindeer heard the recognisable call and started heading down from the ridge, being a herd animal, the rest soon followed. 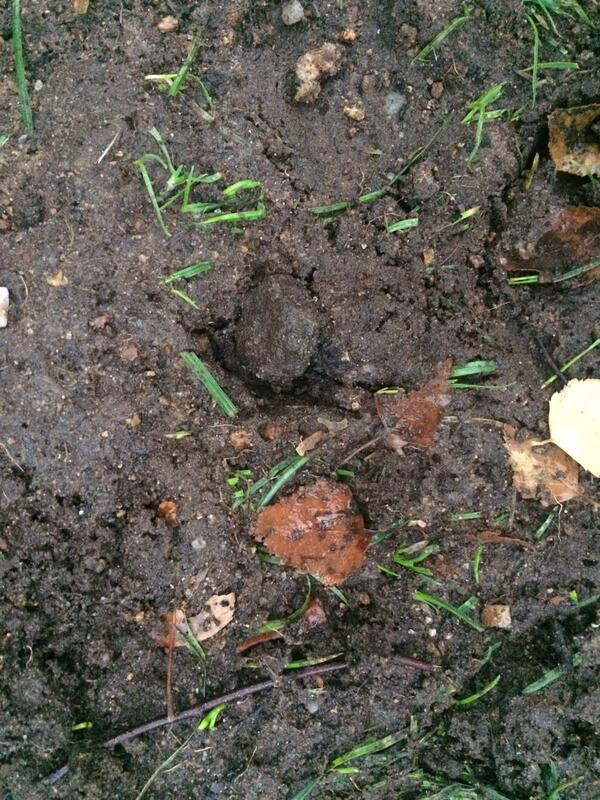 Once they got up close I was most surprised by how much smaller they were than I expected. 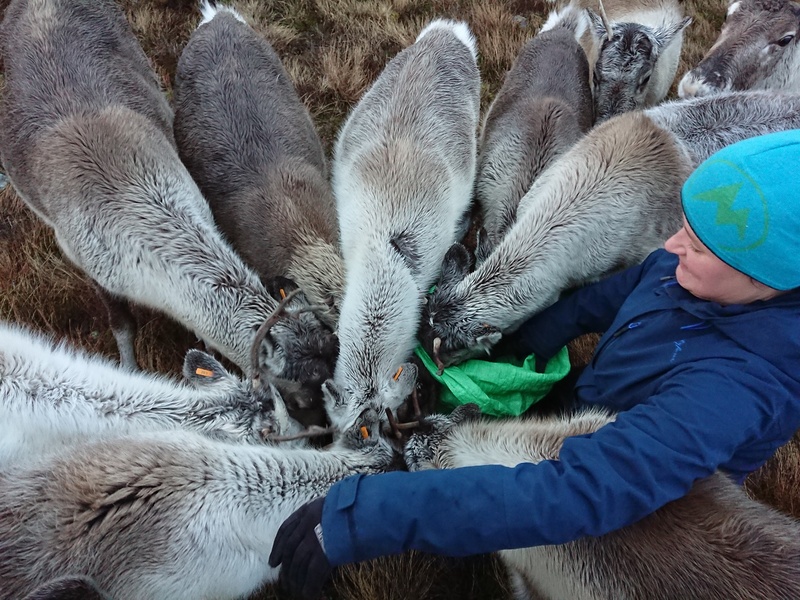 We put out a line of food for the Reindeer on the snow, counted them and we checked them for their general health, as we do every time we go and see any members of the Herd. 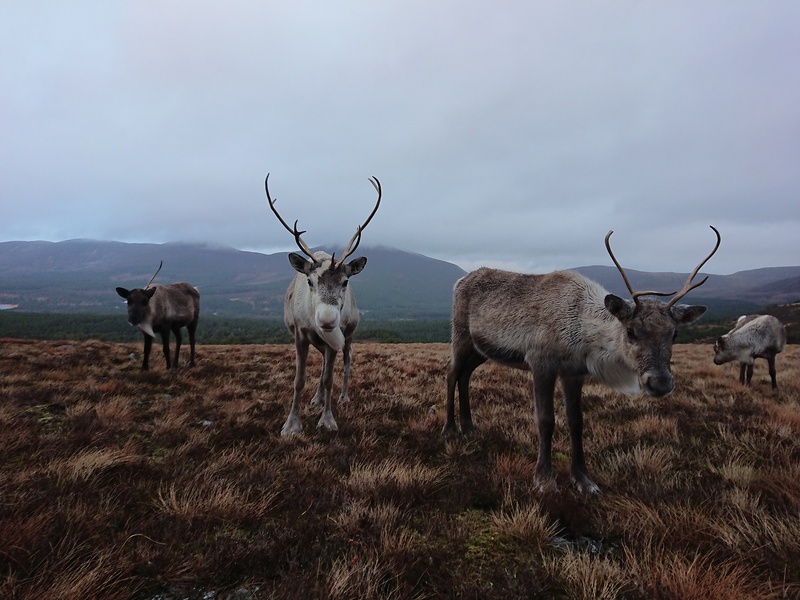 While on my days volunteering I learned that this species of deer are extremely well adapted to the Sub-Arctic environment we have here in the Cairngorm Mountains, it is perfect Reindeer habitat with an abundance of their favourite foods. 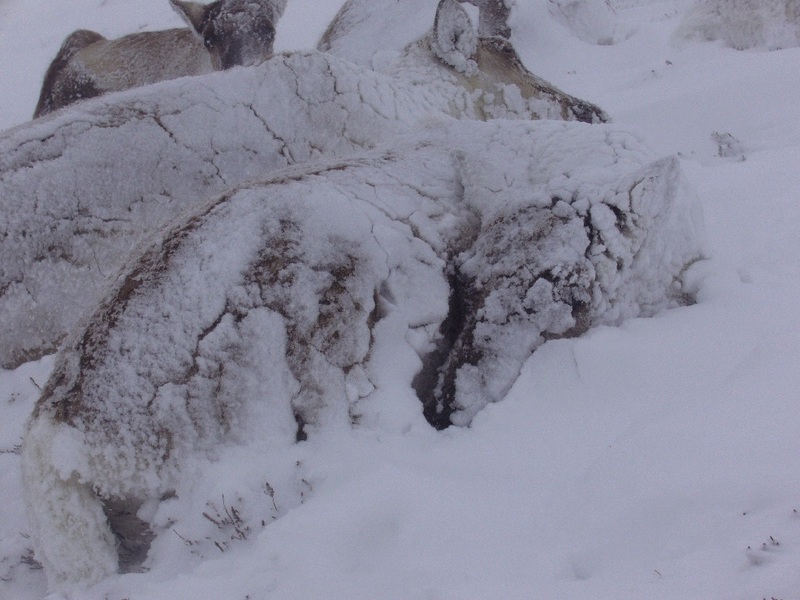 So despite being cold and tired from hiking in the snow in the strong winds, I learned that, unlike myself, Reindeer are comfortable in temperatures of down to minus 30 degrees Celsius, and that the lowest temperature they have been known to survive in is minus 72 degrees C.
In the afternoons of my volunteer days I was able to go along on some of the Hill Trips. 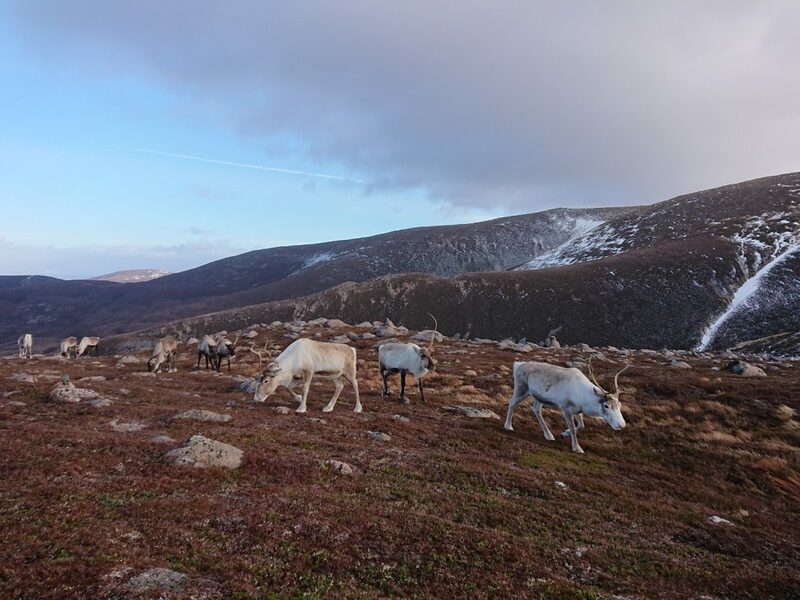 At most times of the year, a couple of times a day, one or two of the Reindeer Herders will guide a visit up onto the mountains to share their knowledge about the history of the herd, interesting facts about these incredible animals and, the bit that people seem to love the most, hand-feeding these mostly gentle animals. 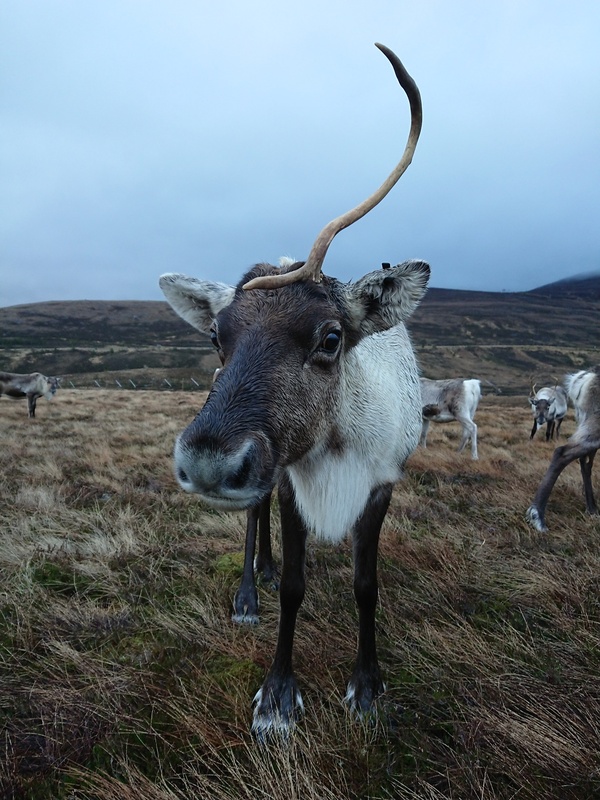 Like most mammals Reindeer have their own characters and personalities, which when it comes to feeding, usually draws out certain characteristics like bolshiness, being greedy or quite cheeky! 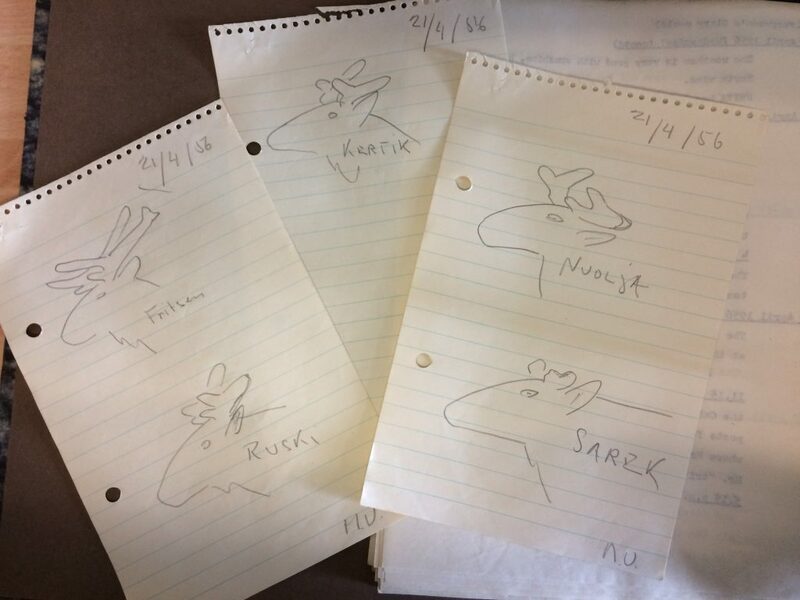 All of our Reindeer have names, so I was able to get some guidance on how to learn them, not only by getting to know their features but also by their lovely and quirky characters. 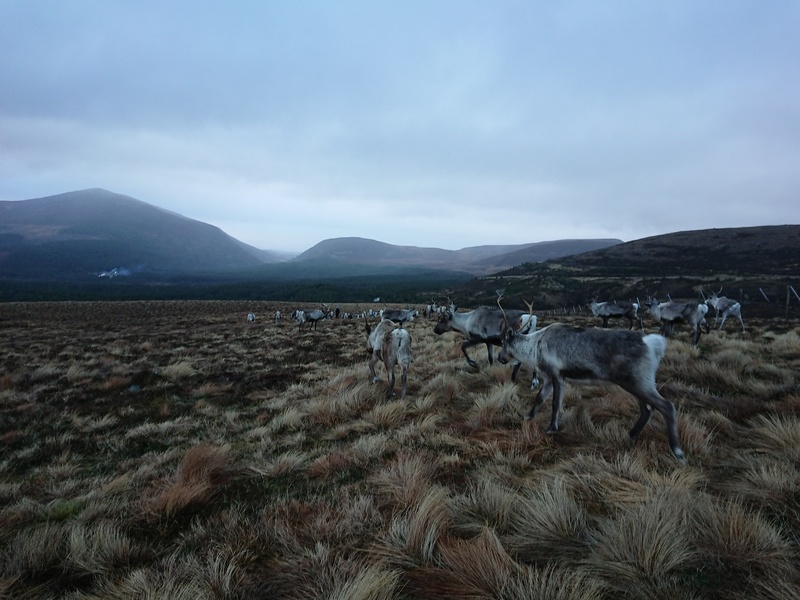 At the end of my winter volunteering I was honoured to be offered a job working as a part time Reindeer Herder at the Centre starting in April 2018. 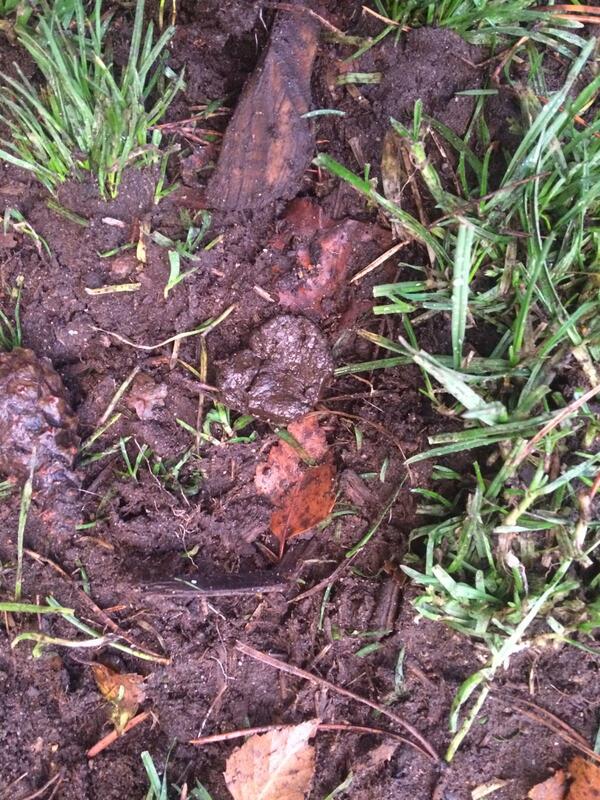 All of the random visitors on one day! 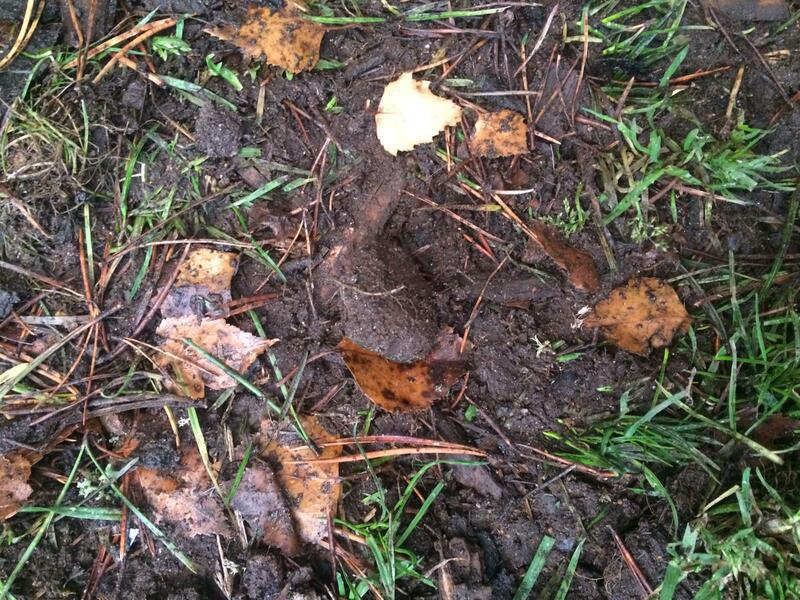 Look at this funny looking calf! 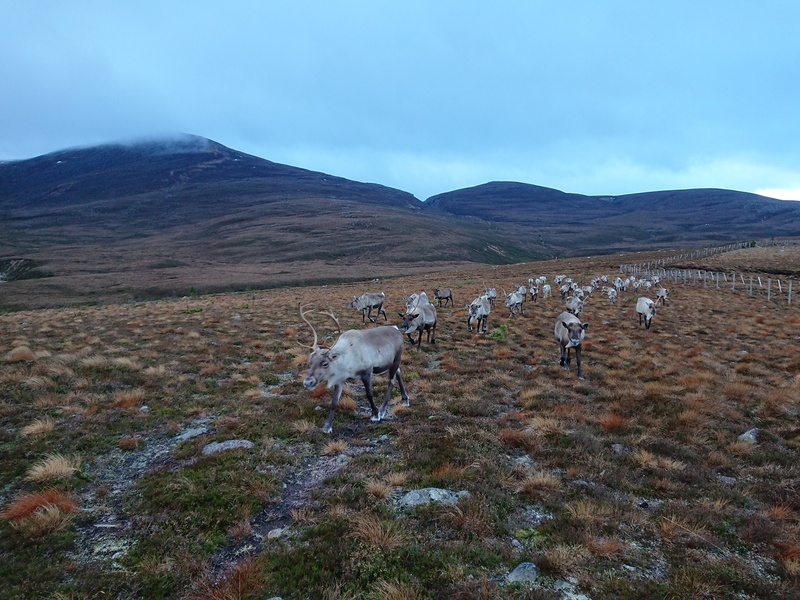 As reindeer herders, one of the first things we do in the morning is opening up the paddocks. 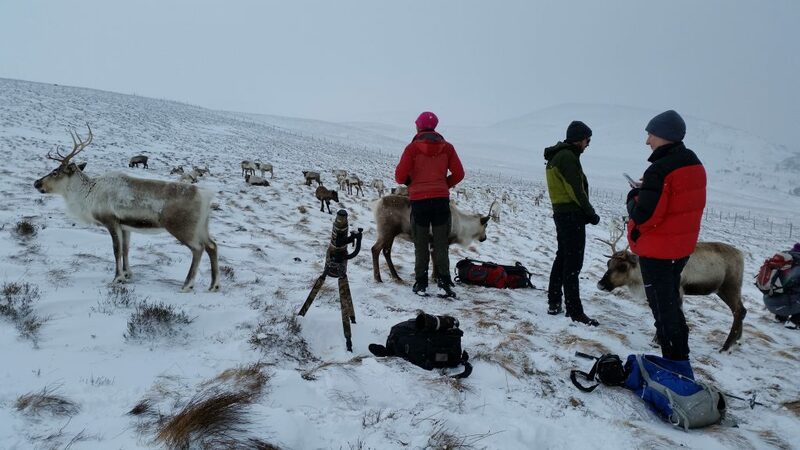 This includes cleaning out the exhibition areas, getting the dvds playing and, the best job of them all, clearing the grassy bits from reindeer poo. We start our day of work at 8 ‘o clock in the morning, which is not the best time of day for some of the herders (read: me). 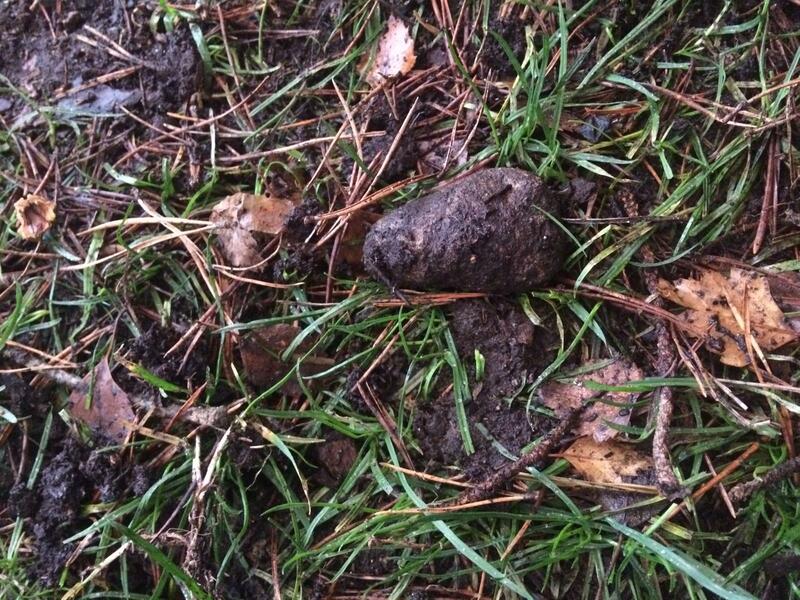 This quite often results in having to squad down to check if a targeted poo is indeed a poo, or if it was a rock posing as one. 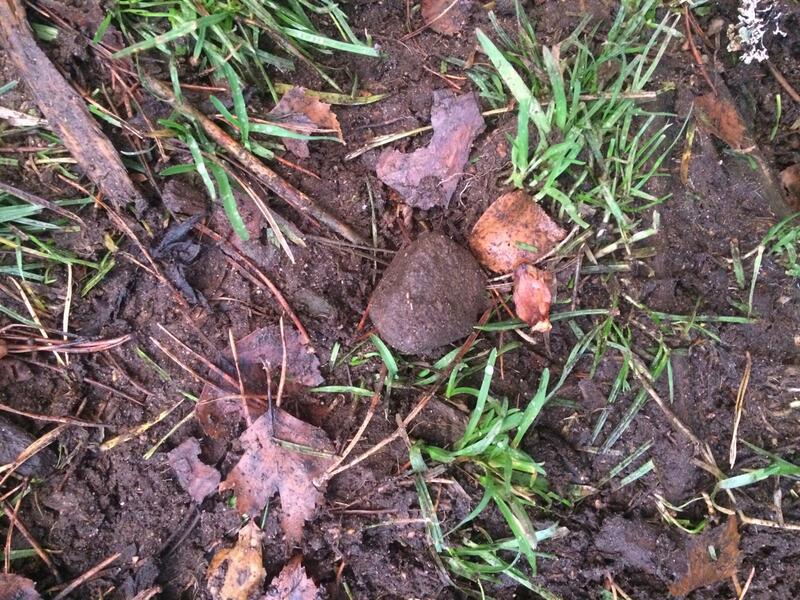 If you don’t believe me, try to play this game of “is it a poo or is it a rock?” and see how well you do! 5: Manouk can’t remember/tell which one it is! 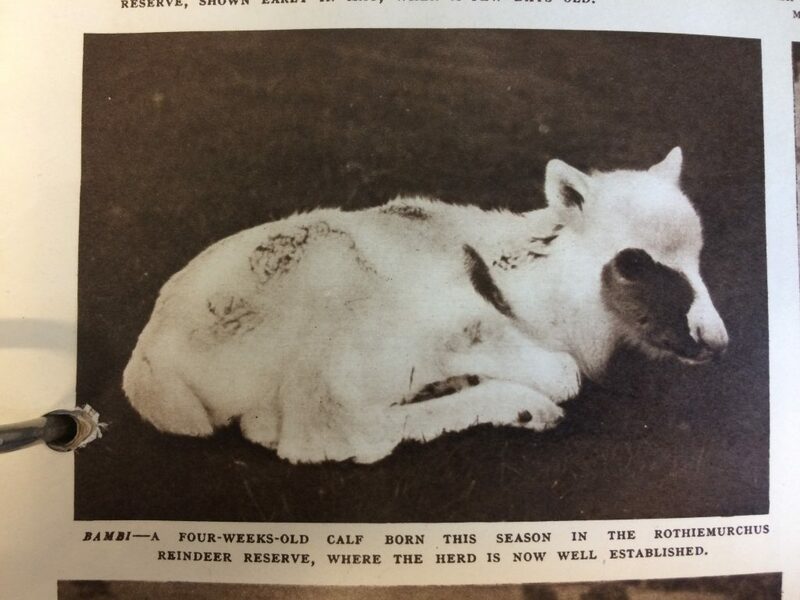 Svalbard was born in the year calves were named after Games and Puzzles, with other reindeer born that year including Hopscotch, Bingo, Monopoly and Jenga. Svalbard was originally named Meccano, however in the autumn of 2011 when he came back off the free-range as a 5-month-old calf we were so struck by his short legs and dumpy body that we nicknamed him Svalbard, after the short, fat reindeer found on the high Arctic island with that name, and it stuck. Now at seven and a half years old you could hardly describe Svalbard as short and dumpy. Maybe just rotund? 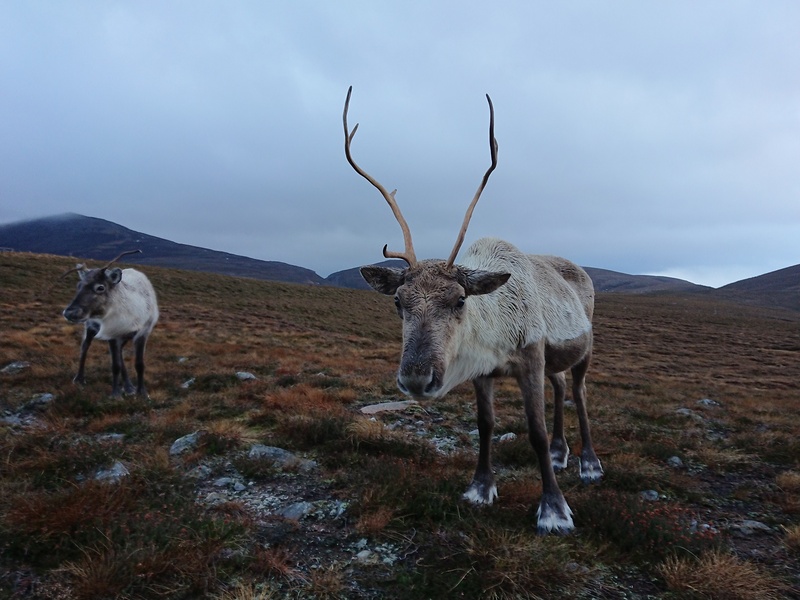 Despite being a late born calf and coming back after the summer at 5 months old without his elderly mum Arnish (who must have died), Svalbard has matured into a really fine reindeer with, dare I say it, attitude. 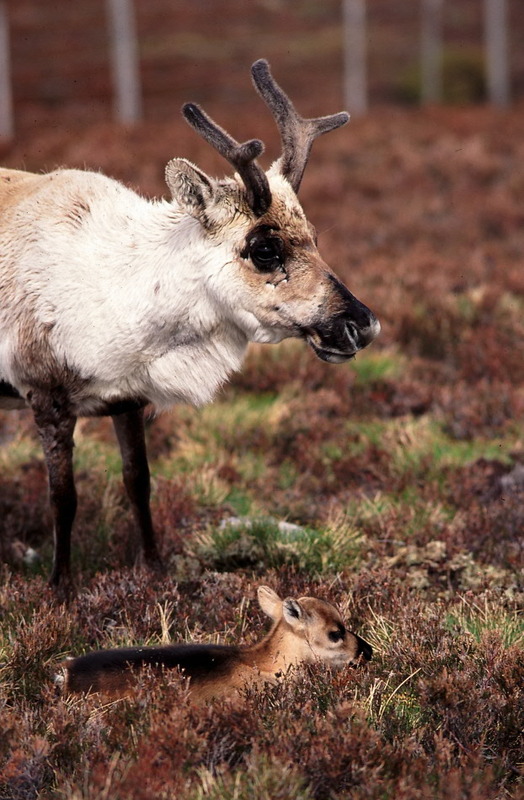 Svalbard comes from a fine family of reindeer. 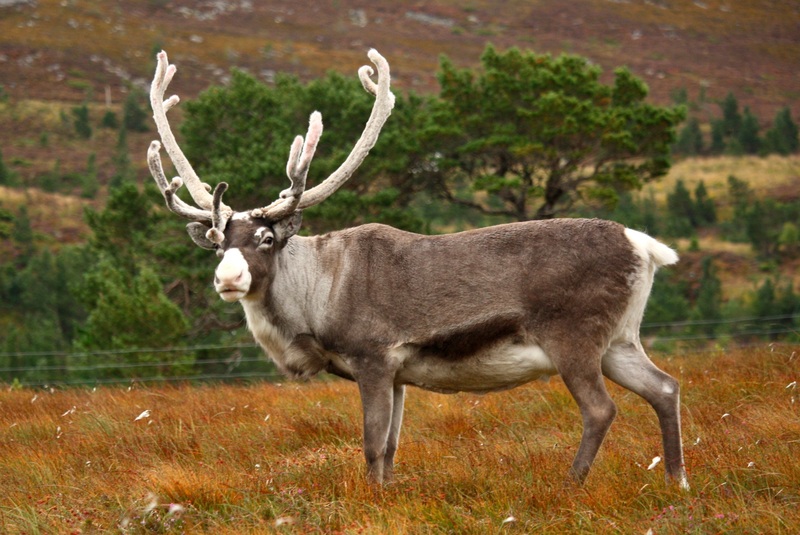 His great-uncle was one of our favourite reindeer of years gone by, Gustav. 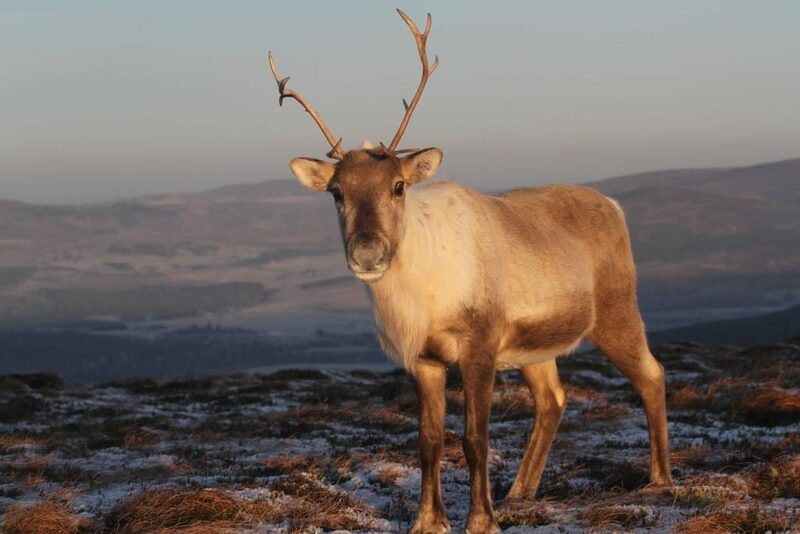 His mother Arnish was a real character in the herd, who despite being antlerless all her life was certainly not disadvantaged by her lack of weapons on her head. 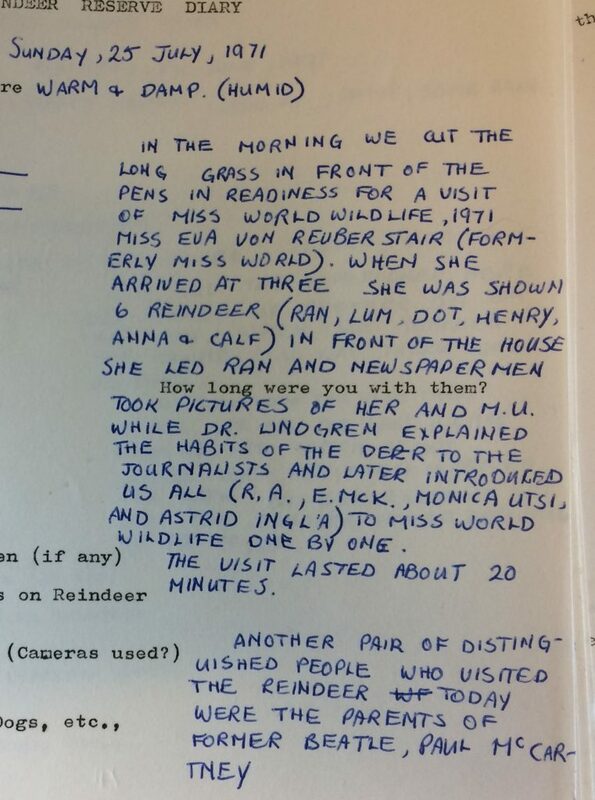 She often took the initiative when it came to confrontations with antlered reindeer and invariably won! 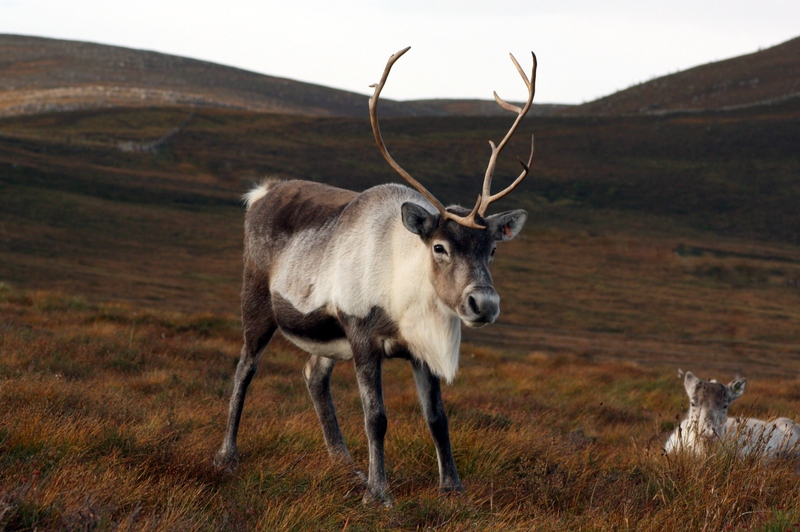 Although a dark reindeer Arnish was prone to producing light coloured calves and in particular white faced calves like Svalbard. 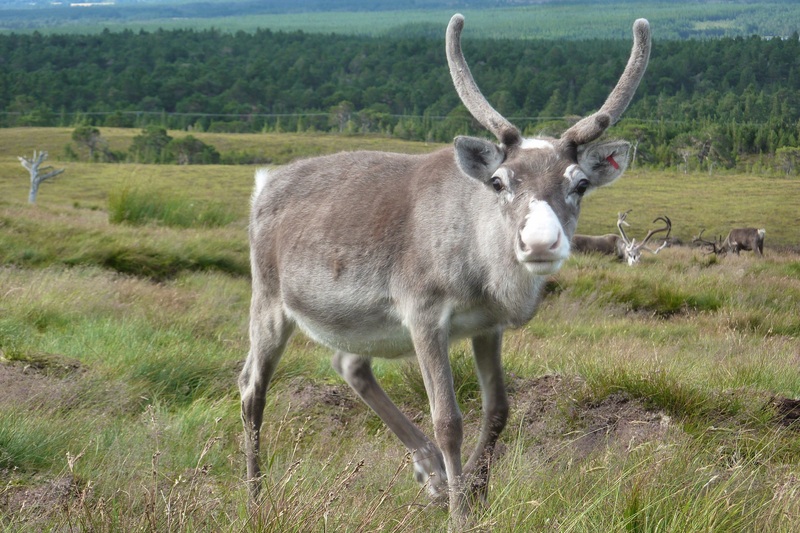 Her daughter born in 2008, Addax, has a white face and has gone on to produce calf Parmesan, who has white markings too. 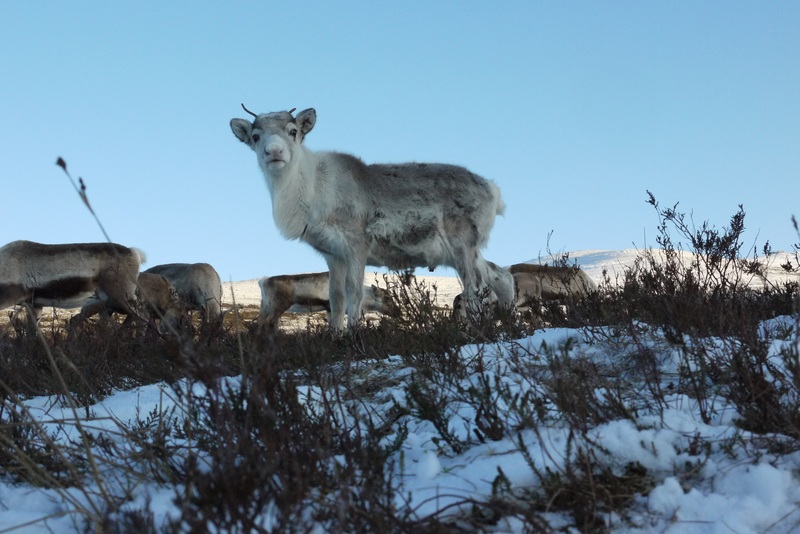 And finally Svalbard reminds many of us of Sven, the reindeer in the Disney film ‘Frozen’ and that says it all.